Escape to the outdoors with the Mantis Trek! 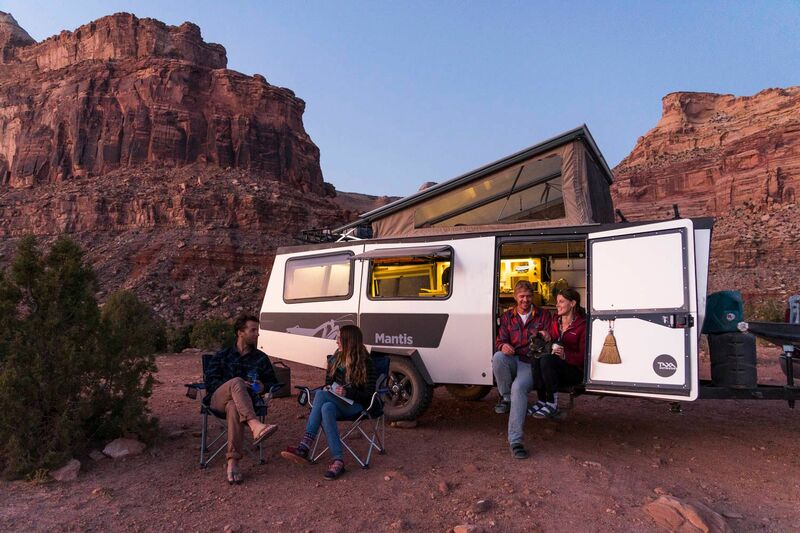 The newest camping trailer from the folks at Taxa Outdoors is a 19-footer that can comfortably sleep 4 adults (yes, adults!) on the queen size bed with under bed storage and a couch that converts to bunk beds. It has integrated plumbing for the 20-gallon fresh water tank, the 22-gallon gray water tank, cassette toilet, and wet bath and an integrated electrical system that is powered by 12 volt batteries. The kitchen is outfitted with a two burner cooktop and sink, fridge and freezer, and the center roof section pops up so you can stand in the kitchen and bathroom areas. Boasting a NASA inspired design, the Mantis Trek is glamping at its finest!